Day 2 is all about continuing to nourish yourself. Once again it is a day in which to be gentle and not overexert or expose yourself to tempting foods and situations. A good way to start each day is with hot water with lemon. I usually boil the water and allow it to cool several minutes, then I add the juice of one half of a large lemon or the juice of one small lemon. You can also add a tiny dash of cayenne pepper or you can grate some fresh ginger and add it to the warm drink. Drinking this first thing in the morning wakes up your gall bladder and digestive tract allowing detoxification to occur. 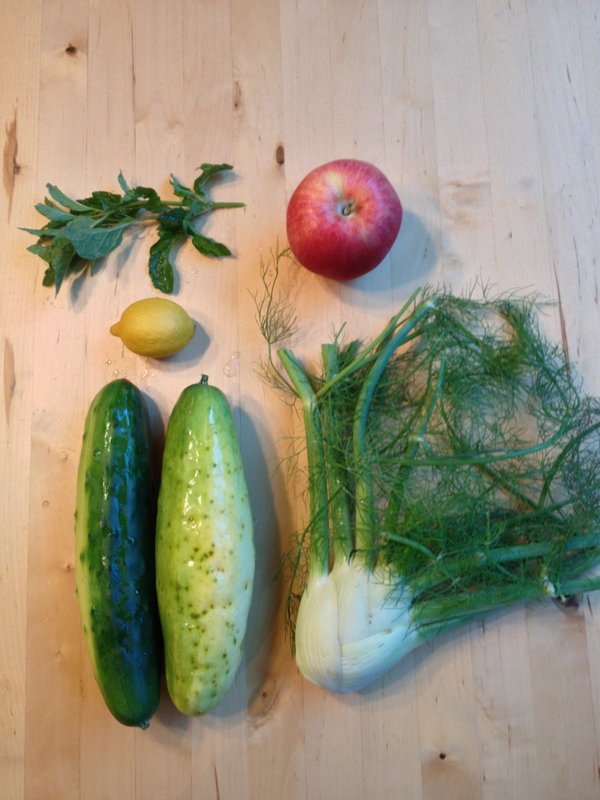 One of the biggest tips is that you want an abundance of juice. 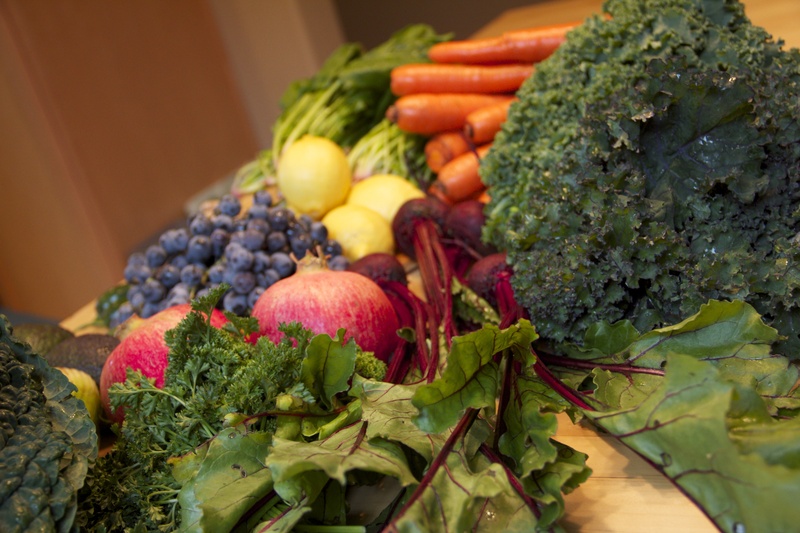 I tend to call it a “Juice Feast” versus a “Juice Fast” to help you keep in mind this is all about super charging your vitamins, minerals and live enzymes via healthy vegetables and fruits. It is not about restriction. The goal is to maintain a normal calorie intake near 1,500 to 2,000 calories a day depending on your size and activity level. Here is a great YouTube video by Fully Raw Kristina that goes over various raw foods and how much it takes of each to hit those calorie targets. Kristina has a lot of other very inspiring and beautiful videos on her YouTube channel, so you may wish to subscribe to her channel if you like what you see. I think where a lot of people go wrong (and I am guilty too) is they reduce their calories leaving them hungry, unsatisfied and weak. You will want to drink 4-6 quarts or more of juice a day as a general rule to hit your target calories. This will vary widely based on what you put in your juice. I encourage you to actually track calories in the initial day or two to help train yourself on what that looks like in juice. Usually you are going to need to juice about every 2.5-3 hours or to have 4-6 juice meals a day and more if you are hungry. 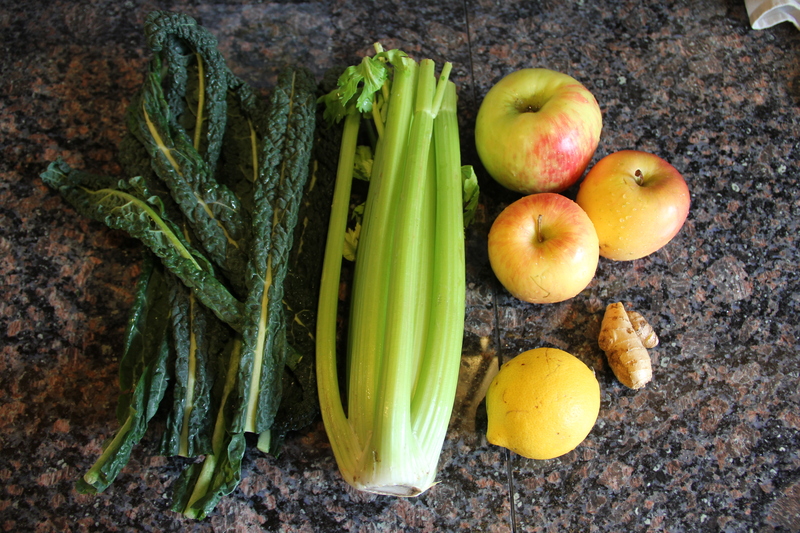 Juicing is not like baking where you need to follow a recipe verbatim for it to rise correctly. Juices can be made from the key categories and combined in your own unique combinations. We will go over this more later. I use the Breville Juice Fountain Elite 1000. On this machine, you can turn the on switch up for soft fruits such as pears, grapes, citrus, and berries and you can turn it down for hard produce such as carrots, apples, celery, etc. I also use the down switch for my greens. Wash your fruits and vegetables and be sure to remove any small plastic labels, so they don’t get caught in your juice or juicer. Peel citrus prior to use. 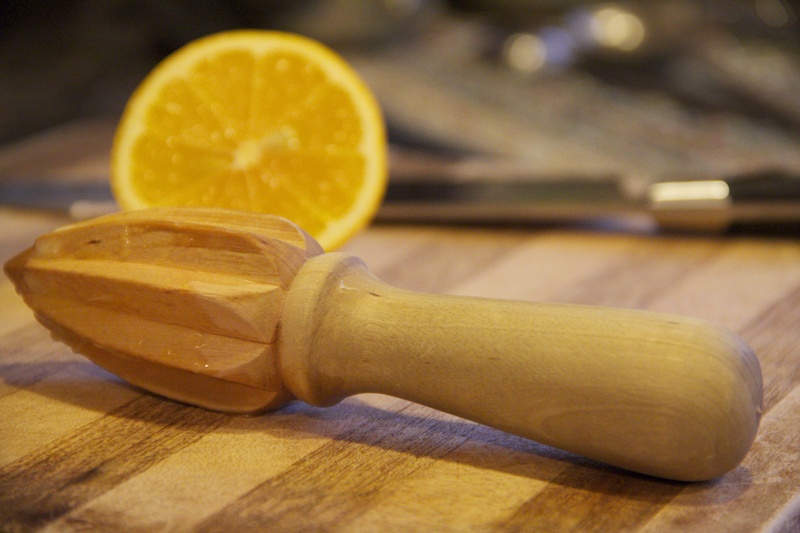 I peel oranges and grapefruits and cut the rind off of lemons prior to putting them in the juicer. 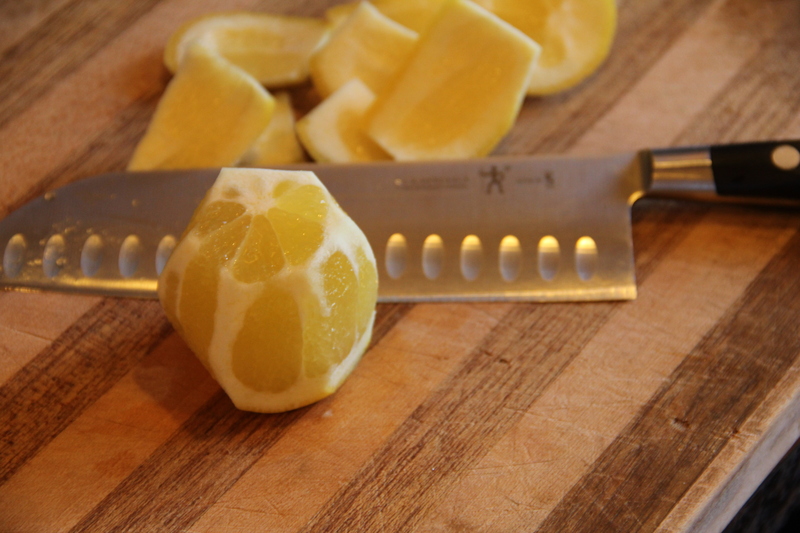 Organic Meyer lemons are the exception as they can be put in the juicer unpeeled. 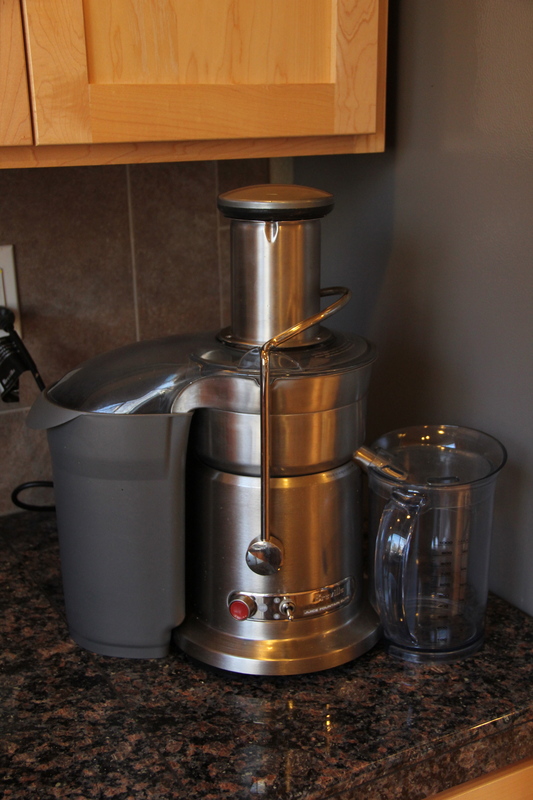 The juicer runs at a fast speed and it can sputter out juice from the area where the bucket meets the grinder. I put a wet rag over this to avoid an splatter on me and the surrounding work area. Using lemon in your juice will help preserve the juice up to 24 hours. It also helps to mellow the taste and to detoxify the body. Some people like to juice everything for the day at once. 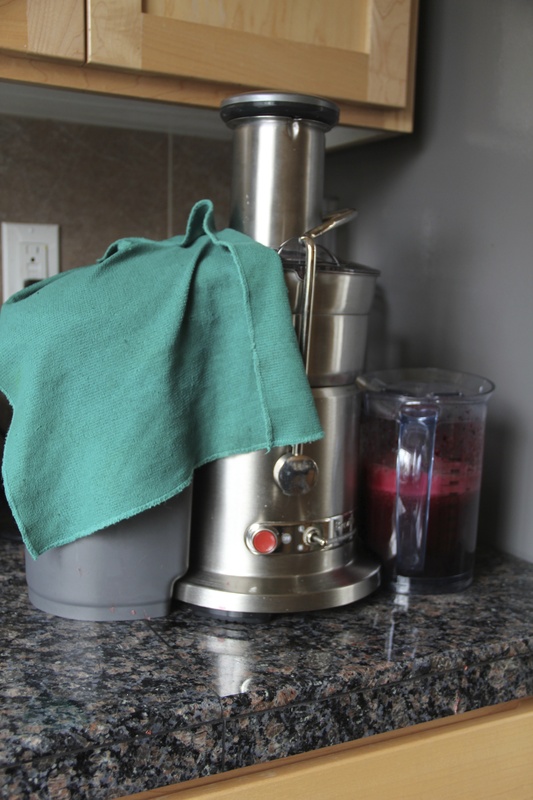 This allows for less cleaning of the juicer, but juices will be less fresh. 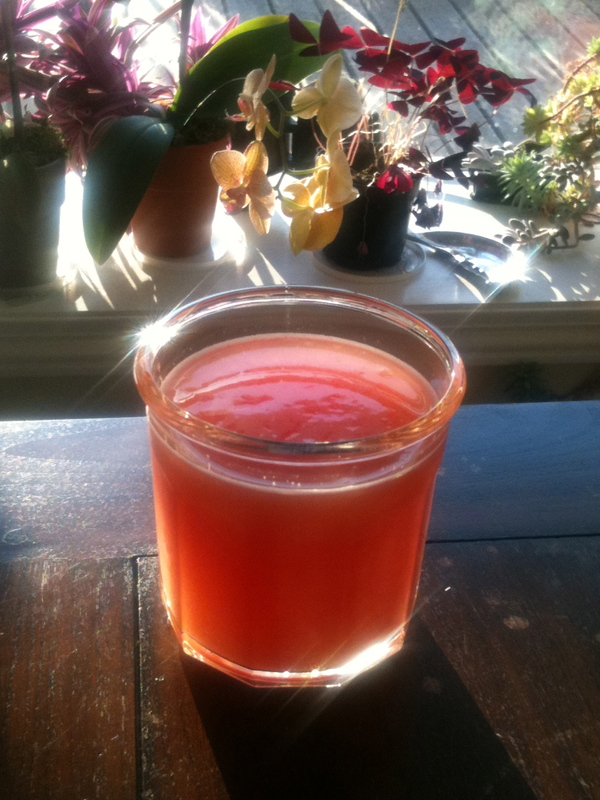 Others will like to juice as they go just prior to drinking their next meal. It’s all about what works for you. Cut the watermelon into pieces with a serrated knife and juice. Drink throughout the day. A 14 pound watermelon is about 1,800 calories. Here is a video on making that juice. Here is a site with juice recipes. I like that this site is interactive and allows you to select what you have on hand and then suggest a recipe for those ingredient. Note: Some sites may make claims or try to sell things. I try my best to go to those with less hype and more balance or extract the good and ignore what doesn’t ring true to me. This site gives exact recipes and some background on possible health benefits. One final thing, please be gentle with yourself as you juice today. It is important to do your best to be at home as your energy may be lower than normal (even with adequate calories). Do not engage in hard physical activity during your first 3 days. Trust if you are sleepy and feel free to take a nap. As I mentioned with juicing you don’t need an exact recipe. 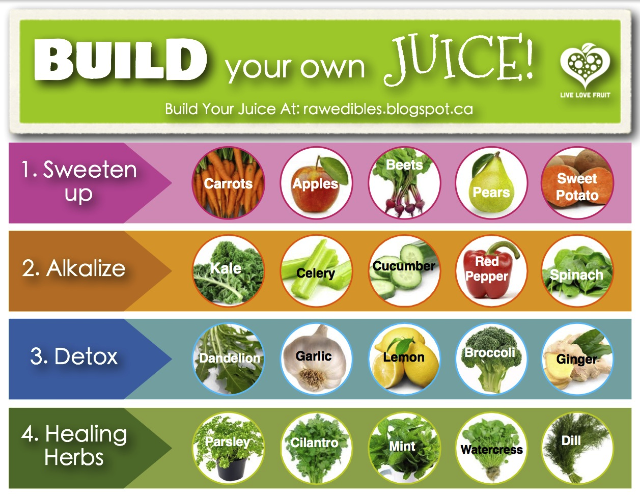 Here is a great blog that goes over the benefits of juicing and key types of ingredients to include in your juices. 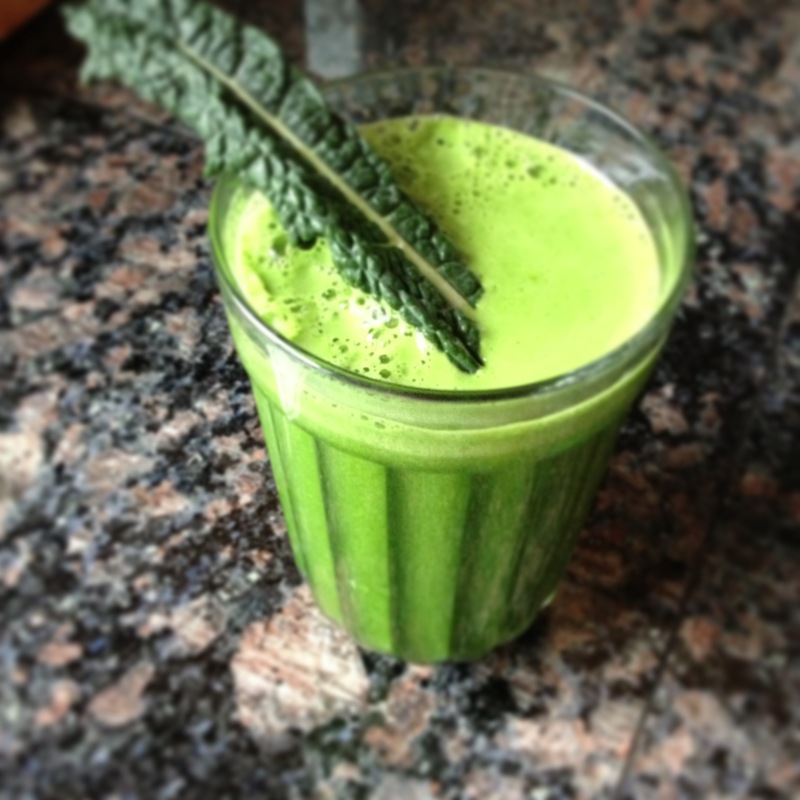 The more green vegetables you use, the more cleansing and detoxifying the juice will be. Fruit or sweet vegetables will help make it more tasty, but be careful not to have too many sweet things in a juice or it can spike your blood sugar, which will lead to the blood sugar dropping and cravings will then occur. Feel free to experiment with ingredients you have on hand. Over time you will know which flavor combinations work for you. It is usually best to have only 1-3 main ingredients and then I often add lemon and ginger if those flavors compliment the juice. Over time, you will find what you like and what combinations to avoid. 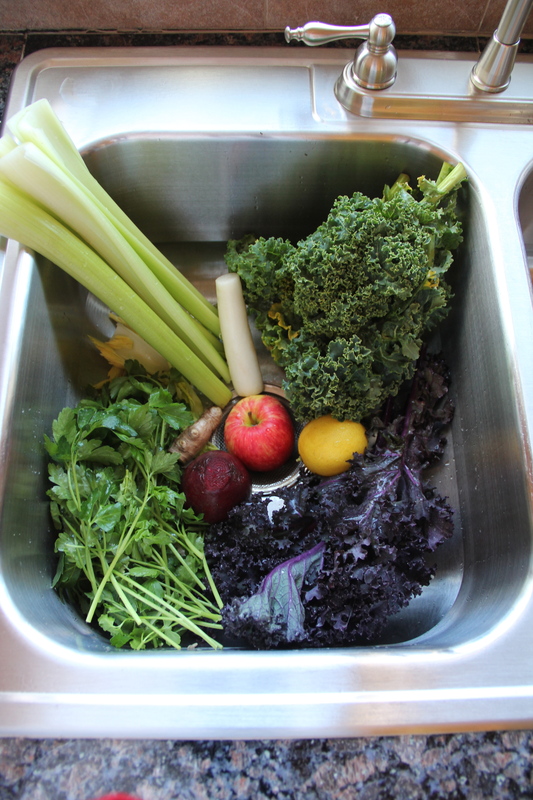 Here is another post about the value of juicing and how it was the single best change in helping with anxiety and depression. My dear friend, Susan, refers to her juice as “happy juice” and once you add juice into your life, you will know firsthand what that means. It does take a little time to get there, so be patient with the cleansing process.